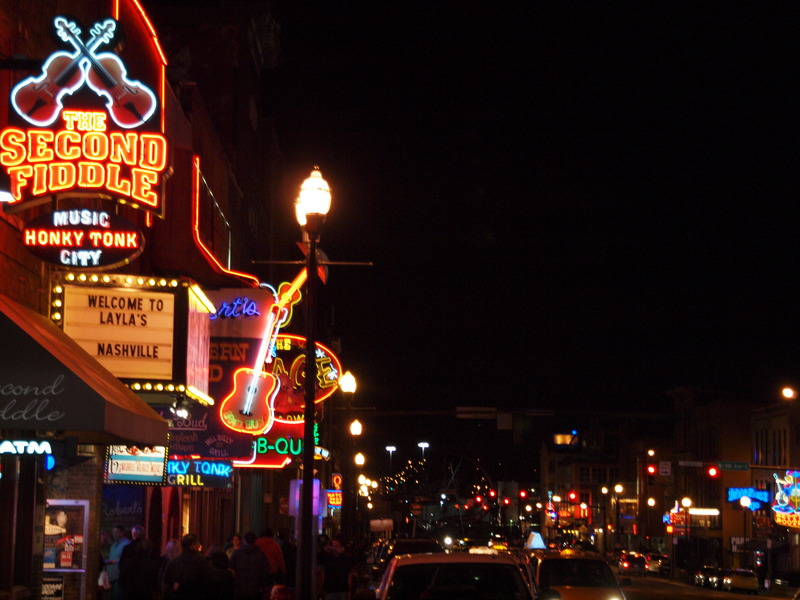 Nashville, the capital of Tennessee, is nicknamed “Music City,” and it’s particularly identified with the uniquely American form of entertainment that is country music. In February 2013, I spent a long weekend in Nashville, sandwiched around an overnight journey to the nearby city of Murfreesboro. During my all-too-brief stay in Nashville, I delved into the history and heritage of country music by exploring some of the places that honour and preserve that past. As well, I checked out out some of the other institutions that make Nashville special. Upon arriving at my Nashville hotel on a Friday night, my first order of business, naturally, was to sing karaoke in the hotel bar. But immediately afterward, I jumped into a cab and headed to a unique attraction: a full-scale replica of the Parthenon, complete with meticulous re-creations of the friezes on the pediment and entablature. 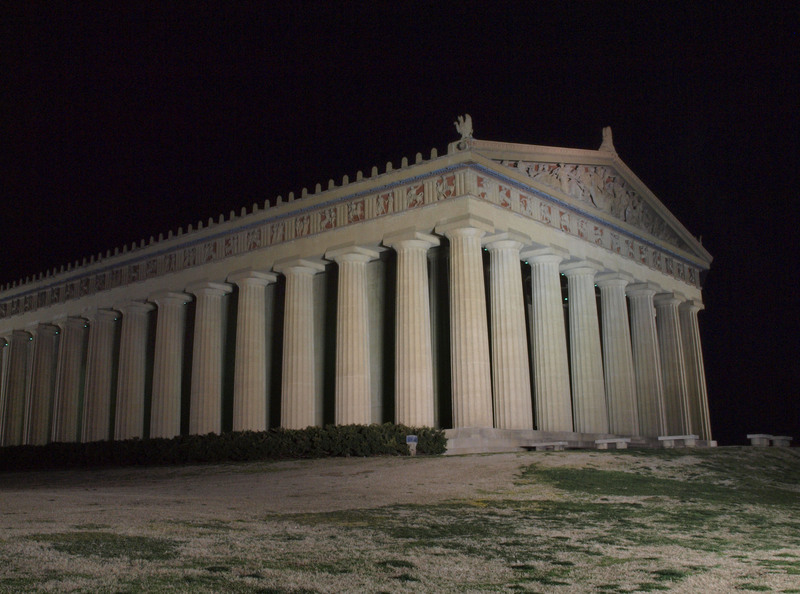 Nashville’s full-scale duplicate of the Parthenon, in Centennial Park. 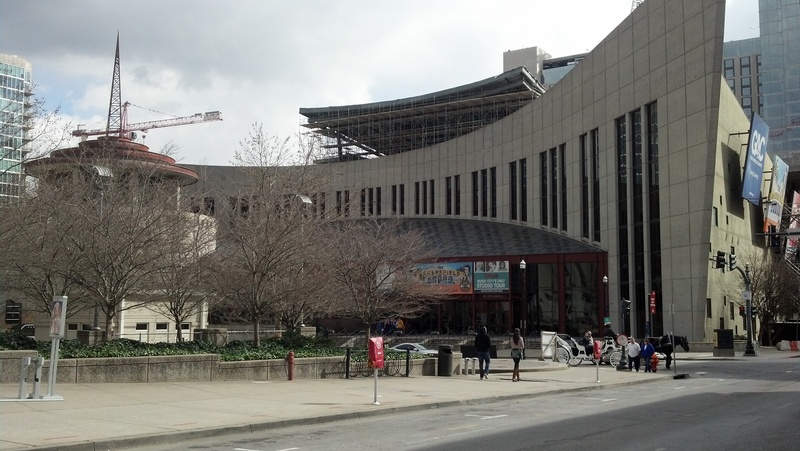 The Country Music Hall of Fame and Museum is a world-class cultural institution. A park in front of the museum contains the Music City Walk of Fame, similar to the Walk of Fame in Hollywood but devoted to persons who’ve contributed to the musical heritage of Nashville. It’s not restricted to folks in the country music field, although artists who excelled in that genre are, of course, well-represented. 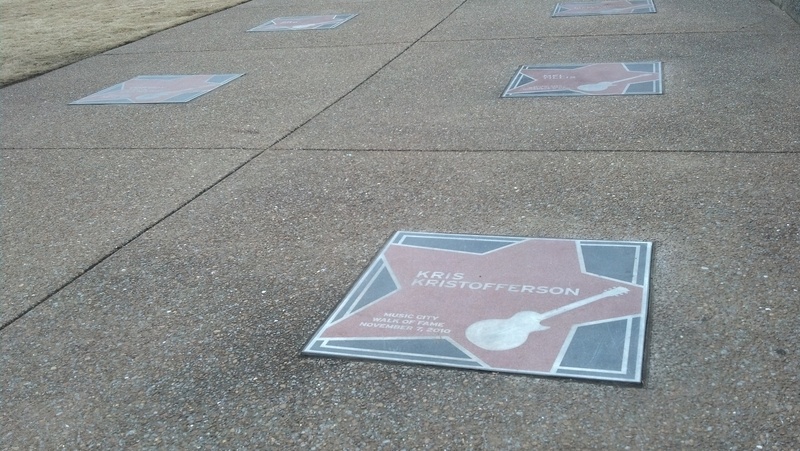 Kris Kristofferson is among the luminaries honoured with a star on the Music City Walk of Fame. 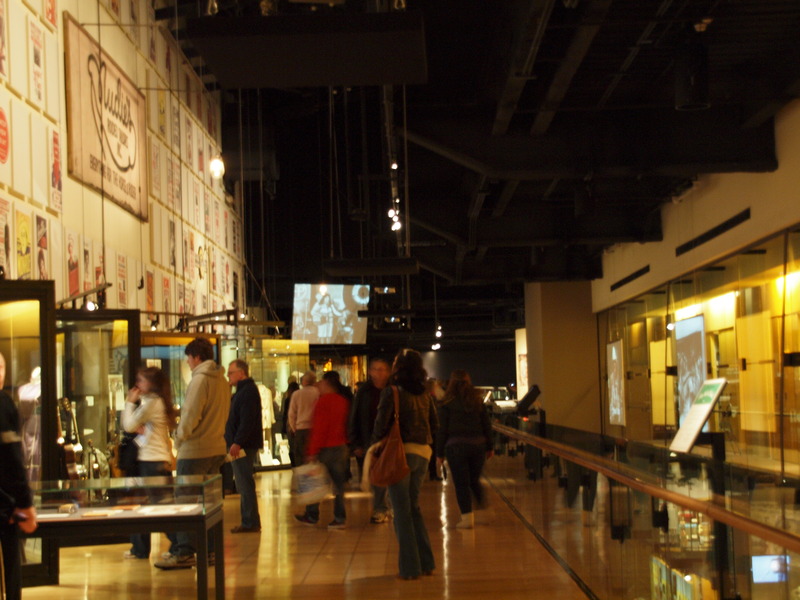 Inside one of the galleries in the Country Music Hall of Fame and Museum. 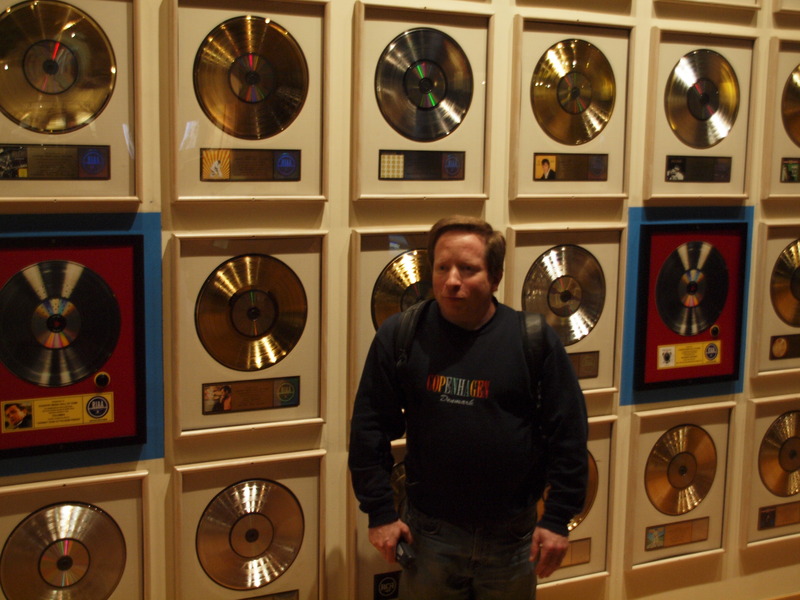 Me in front of some gold records in the Country Music Hall of Fame and Museum. 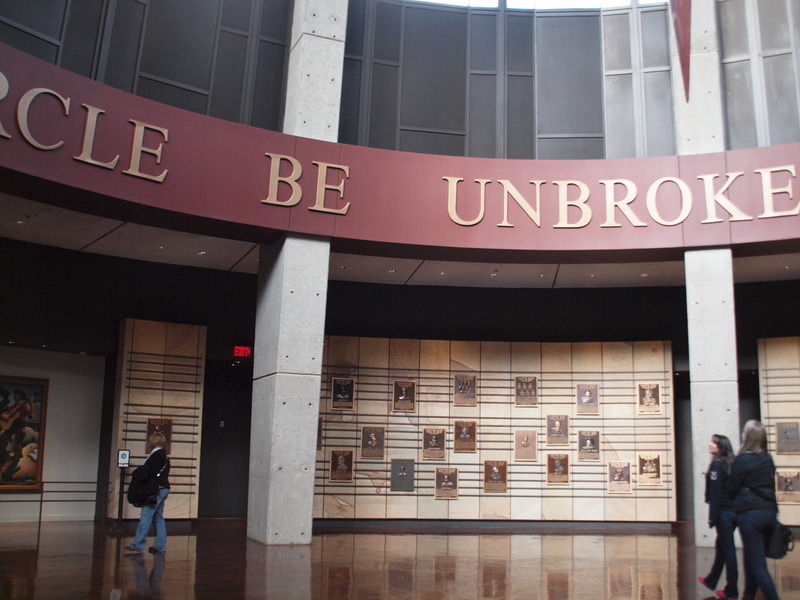 A highlight of any visit to the CMHOFAM is stepping into its Hall of Fame Rotunda, a cylindrical room in which you can read bronze wall plaques that recite the accomplishments of the inductees. 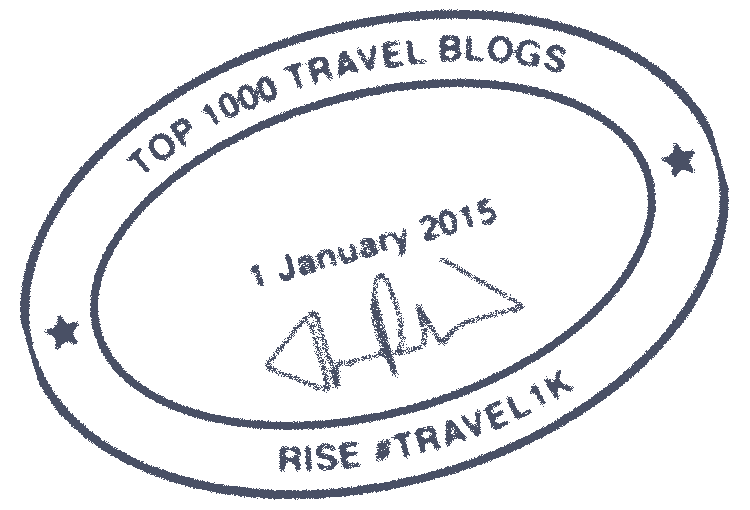 A full list of those inductees can be found here. Inside the Hall of Fame Rotunda. Incidentally, the CMHOFAM is currently in the midst of a renovation that will double its exhibition space and add amenities such as an 800-seat theatre. When the expansion is complete, a visit to the museum will be even more educational, informative, and fun! 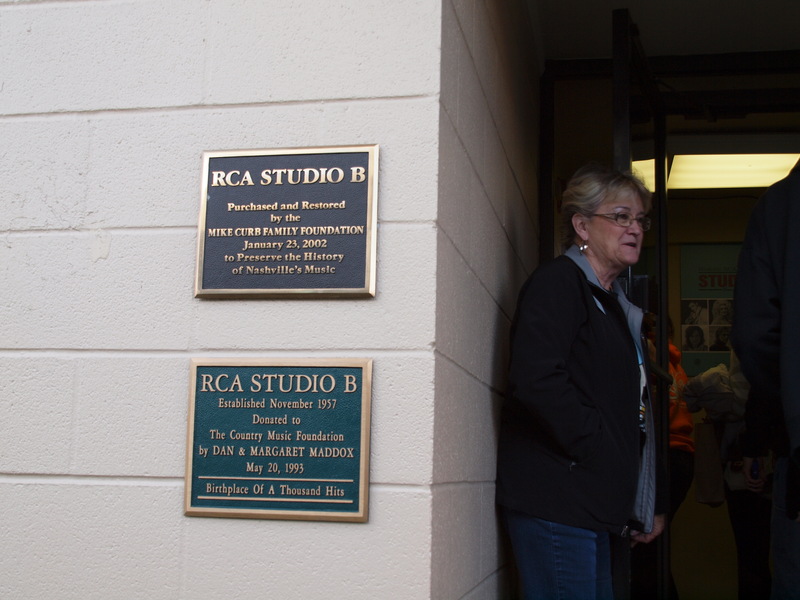 When purchasing my admission ticket to the CMHOFAM, I added an optional excursion to nearby RCA Studio B. This historic recording studio was the place where many of the most legendary country music tunes were created. 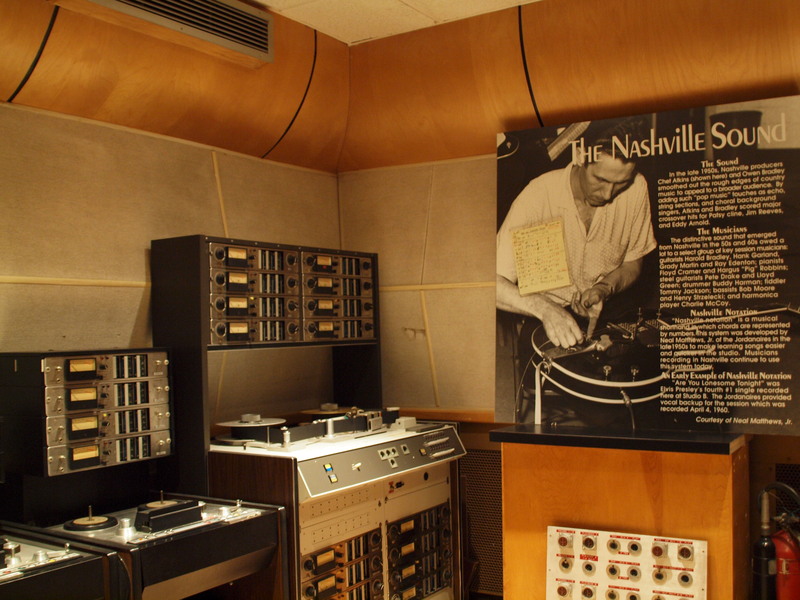 Elvis Presley, who himself was heavily influenced by the “Nashville sound,” recorded some of his biggest hits in Studio B. 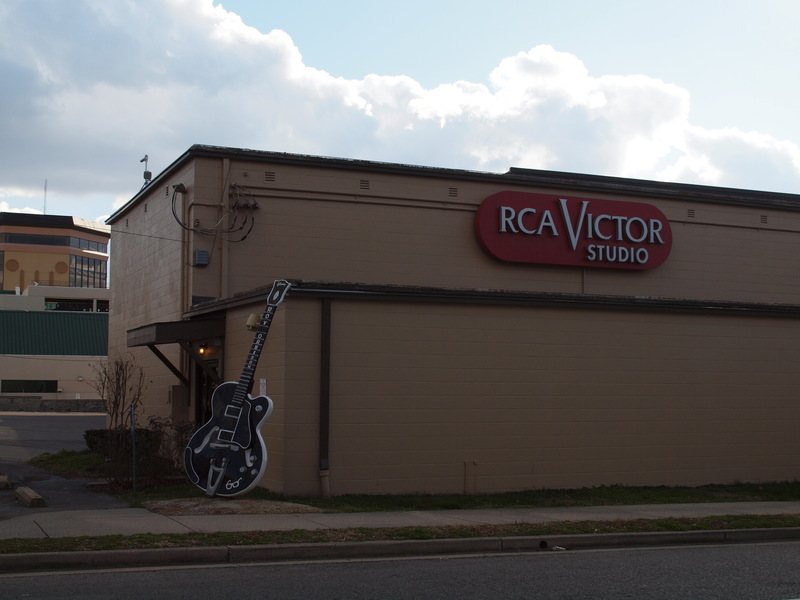 The exterior of historic RCA Studio B. 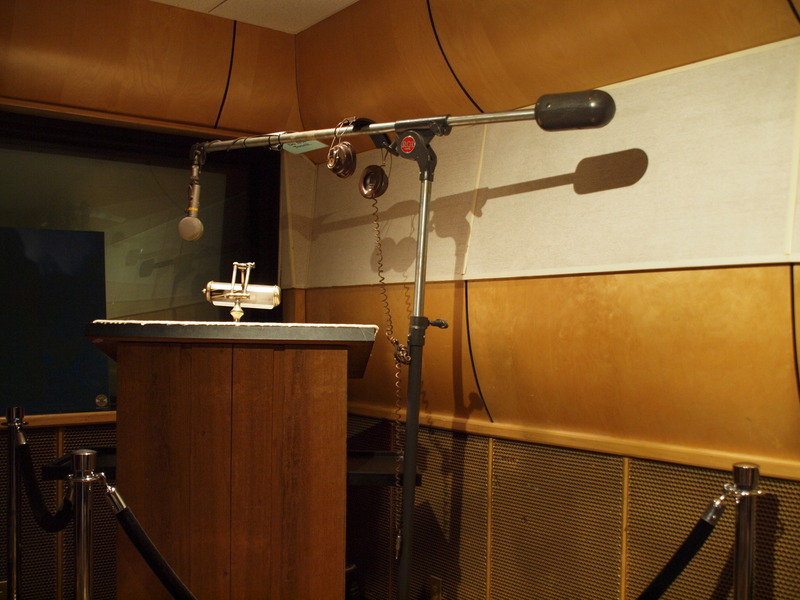 An original microphone in Studio B. 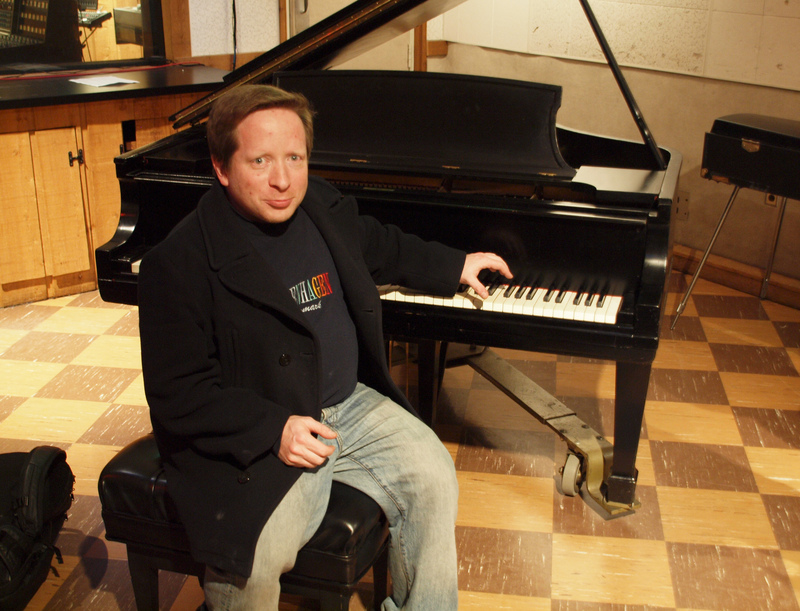 Me at the piano that Elvis used to play. The King liked this piano so much that he wanted to buy it and install it at Graceland (his house in Memphis, Tennessee). However, the studio rebuffed his offer, advising him that the piano was not for sale. Tours of Studio B are only offered as part of a combination package with admission to the CMHOFAM. (The museum runs you over to the studio in a motorcoach, then brings you back.) I highly recommend going for that add-on. Nashville neon: looking down Broadway at night. A sign in Robert’s Western World, a honky-tonk on Broadway. 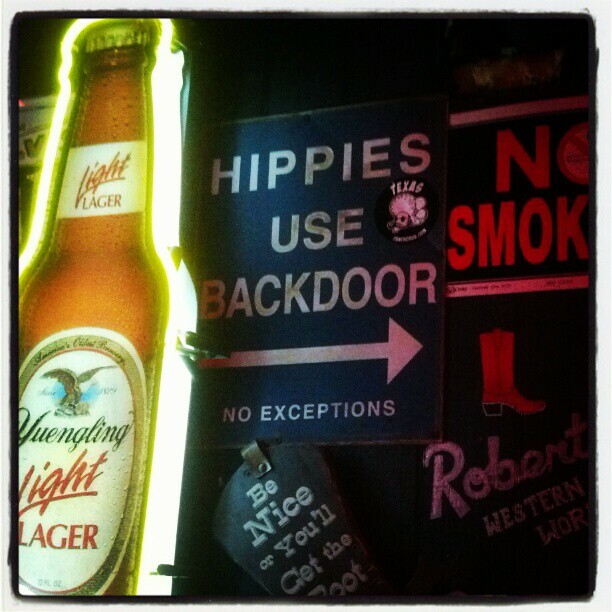 Robert’s Western World is not safe for hippies! By the way, a honky-tonk is defined by wikipedia as “a type of bar that provides musical entertainment (usually country music) to its patrons”; and honky-tonks are especially prevalent in the American South. In Nashville, a specific part of Broadway that abounds with such establishments has been dubbed “Honky Tonk Row.” Even on a Sunday night, bar after bar along that strip was offering live music — often to packed houses. 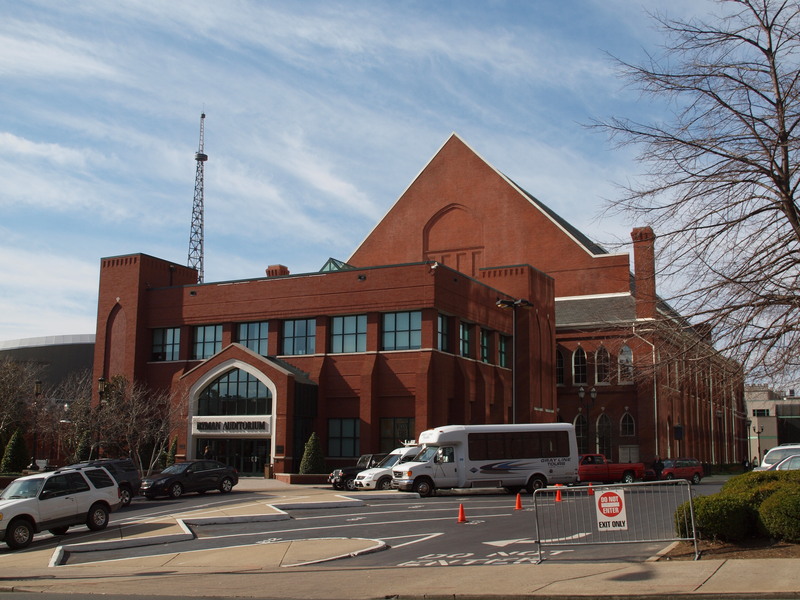 On Monday morning, before catching my flight back to New York, I moseyed on over to Ryman Auditorium, a storied performance venue in the heart of Nashville’s downtown. It’s perhaps best known as the theatre from which the long-running television program The Grand Ole Opry was broadcast from 1943 to 1974. The Grand Ole Opry is a variety show. Featuring country music performances as well as skits and comedy sketches, it originated as a radio program in 1925 and is still going strong today. Ryman Auditorium in downtown Nashville. 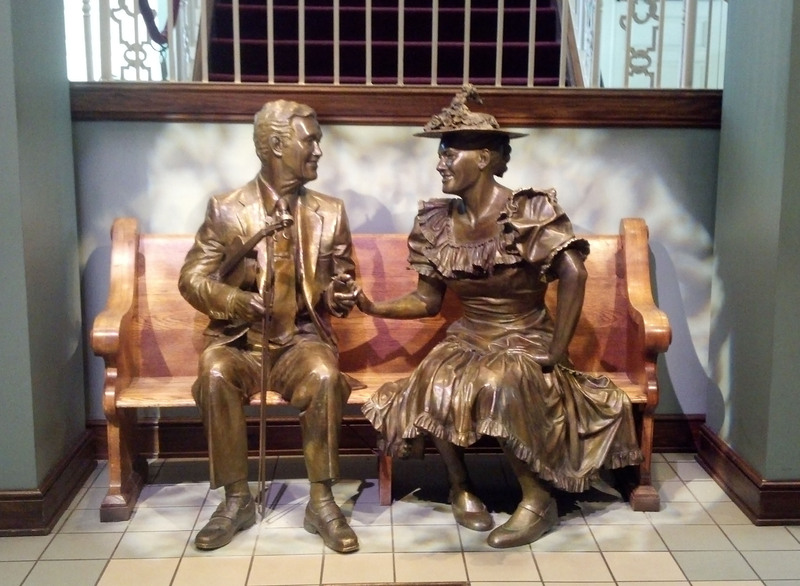 When you enter the lobby of Ryman Auditorium, there are statues of Minnie Pearl (1912-1996) and Roy Acuff (1903-1992) seated together on the bench. The statues of Roy Acuff and Minnie Pearl seated in the lobby of Ryman Auditorium. Ms. Pearl (born Sarah Ophelia Colley) is undoubtedly the most iconic cast member in the long history of The Grand Ole Opry; with her catchphrase “How-w-w-DEE-E-E-E! I’m jes’ so proud to be here!,” her character on the show satirised “hillbilly” culture from the southern United States. Mr. Acuff, the first person inducted into the Country Music Hall of Fame while still alive, was known as the King of Country Music. As a singer, Acuff appeared often on The Grand Ole Opry; he also founded an influential country music record label. Of course, I can hardly do justice in a single paragraph to the accomplishments of Ms. Pearl or Mr. Acuff. As with so many other people that I learned about during my weekend in Nashville, I want to find out more about them. 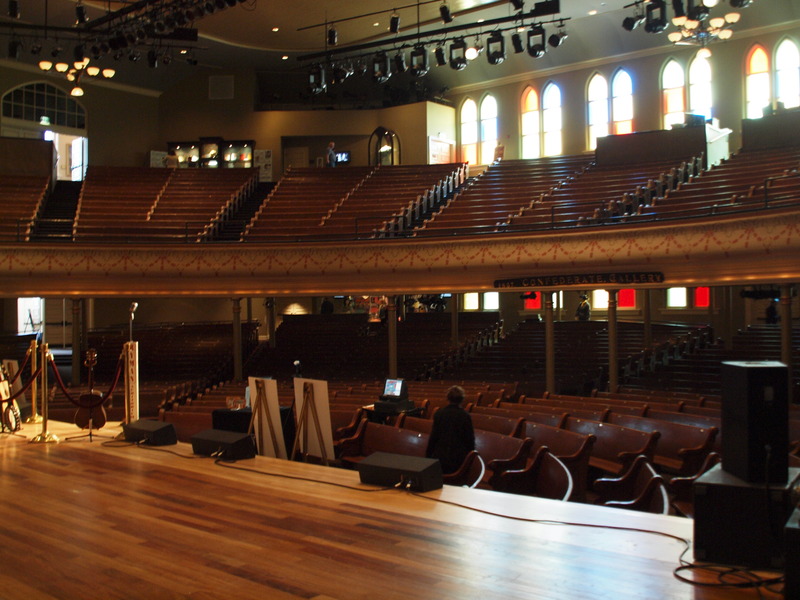 Inside Ryman’s main auditorium, I was able to gaze down upon the celebrated stage that was graced over the years by luminaries like Minnie Pearl and some of the biggest names in country music. I then got the chance to imagine what it would have been like to stand on Ryman Auditorium’s stage and look out at the audience. On the famous stage in Ryman Auditorium. Because I’m an international karaoke singer, the management even permitted me to belt out a song on that fabled stage! 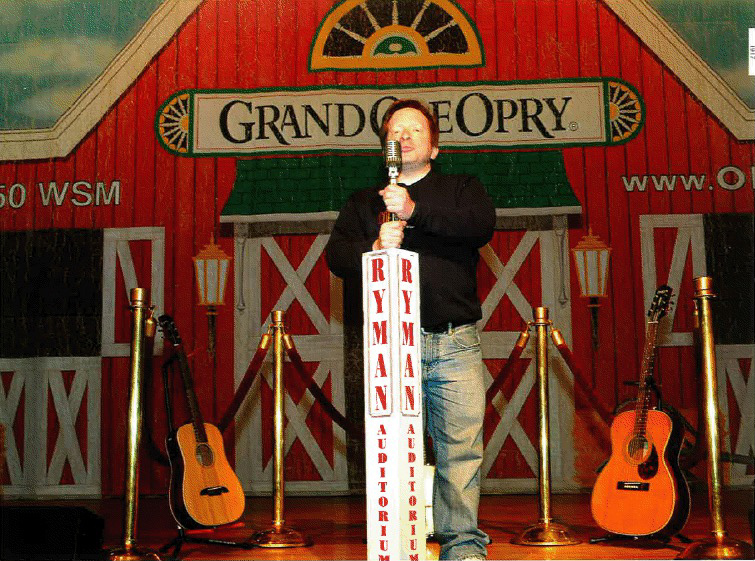 Me grabbing the mic on the Ryman Auditorium stage. Okay, not really; I paid $10 for this photo op. 🙂 And sadly, no singing was involved. On the way to the airport, I had my cabbie make a quick stop so that I could take a photograph of Union Station. 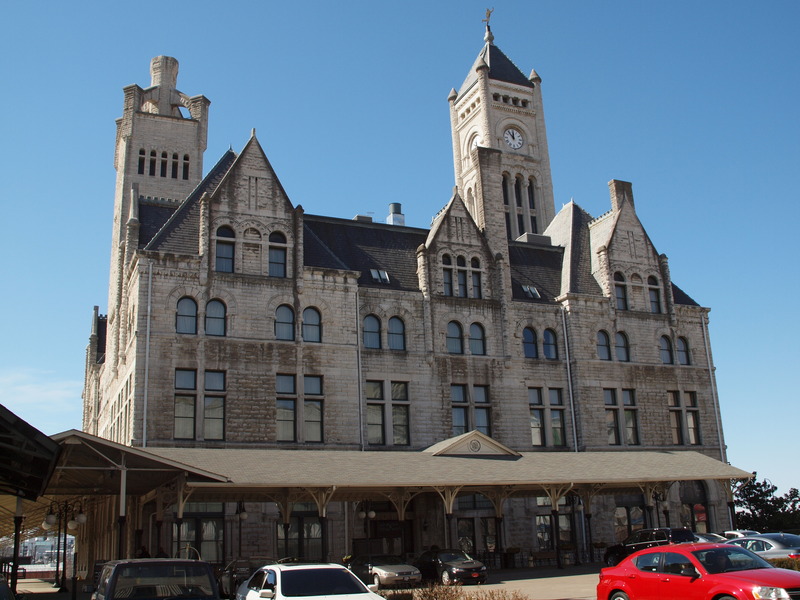 A former rail terminus, Union Station is now a swanky hotel. (It calls itself the “Union Station Hotel.”) From what I’ve heard, it’s worth a look inside, to admire features such as a 65-foot barrel-vaulted ceiling and stained glass windows. 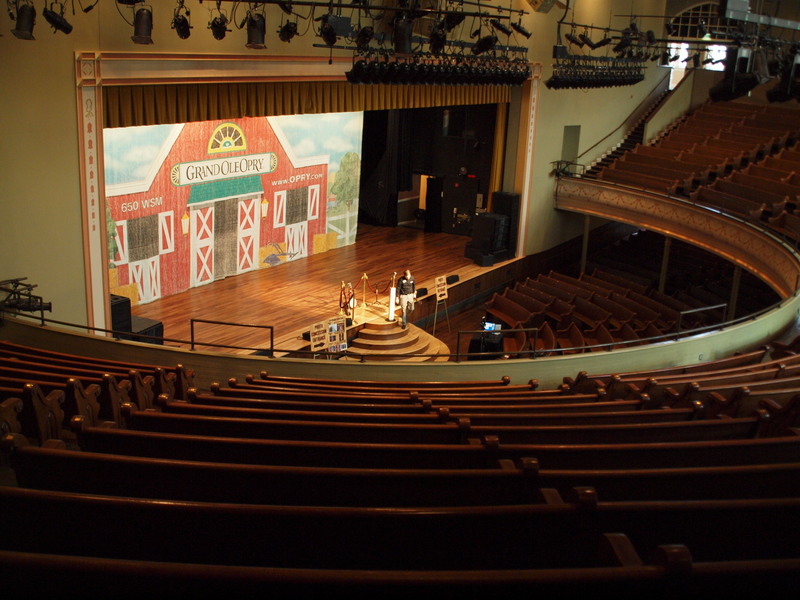 You can be an audience member for a live broadcast of The Grand Ole Opry at its current home. That home, known as the Grand Ole Opry House, is about nine miles east of downtown Nashville. Tours of the building are offered. Located about 10 miles east of downtown Nashville is the Hermitage, the plantation and home that was owned by Andrew Jackson, the eighth President of the United States. (Jackson, nicknamed “Old Hickory,” served as President from 1829 to 1837.) Given that I’m a history geek, the Hermitage will be at the top of my list the next time I’m lucky enough to make it to Nashville. Dollywood is an eponymous theme park co-owned by country music star Dolly Parton. It’s located in Pigeon Forge, Tennessee, about a three-hour drive from Nashville. Dollywood offers traditional amusement park rides, and also showcases indigenous crafts and music from the Smoky Mountains region in which it’s found. Also on the site is the Southern Gospel Museum and Hall of Fame. Have you been to Nashville? Do you have any suggestions for additional activities there? Love the photo up on stage at the Ryman. I was sad that the Country Music Hall of Fame was closed on my visit. I guess it’s just another reason to return to Nashville! @W~C~B~F~F: I’m glad you like the pics. I found a lot of photogenic places in Nashville! And I was definitely taken with the neon lights on Broadway.